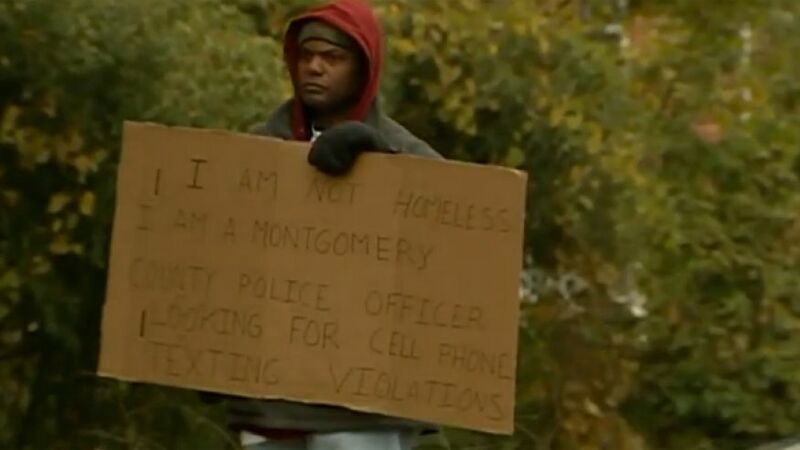 Cops in Maryland disguised an officer as a homeless man on Tuesday as part of a sting operation to nail motorists who were texting while driving, FOX5DCreported. If the disguised officer spotted someone texting, he’d radio to a uniformed officer nearby to pull that car over. “Ultimately, the law is a hands free device, so it can’t even be in your hand,” Officer Brian Nave told WUSA9. One driver who was caught, gave the cops credit for their ingenuity. During the two-hour sting, police issued 56 traffic citations and 22 warnings for a range of infractions, according to WTOP. A texting ticket cost offenders $70 and a ticket for talking on the phone while driving is an $83 hit. This post was republished from foxnews.com. You can find the original post here.